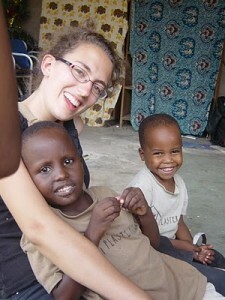 Ellen Fitton tells more about her time in Tanzania. Thanks Ellen! I have been very busy since I last wrote. On Thursday we visited the plaster house which was the most amazing place. There were about 70 children all of who had just had operations. There were lots of children that had just had their cleft palate’s operated on and there were quite a few with their legs in casts. It was amazing as they were so happy and they just loved having a bit of one on one attention. Some of them have been there for months and they live very far away so their families don’t tend to visit and there are limited nurses there. 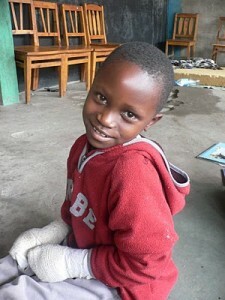 There was one boy that had had a tumor removed from his face and he had an operation to widen his eye. He was the happiest child and ran up to us straight away and wouldn’t leave kate alone for the whole time that we were there. There were also twins that were about 4 weeks old – one of them was fine but the other had had an operation on its cleft palate and it had obviously got infected. Their mother was very young and obviously had her hands full so we looked after her babies for about an hour so that she could go and shower and do some washing which she was very grateful for. It was the most amazing place and we felt we had really made a difference to the kids’ lifes! 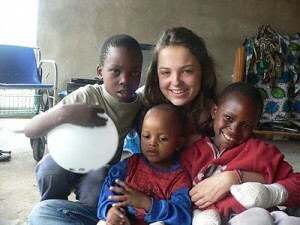 I love all the children there and I have fallen in love with a little boy called Peter. We spent the time playing with bubbles, balloons, pencils and balls which was good fun and the children seem to really enjoy the afternoons we spend there. This weekend we had to waitress at Mad’s (our representative for the company out here) party which was good fun and we met some very interesting people. We then attended a church service on Sunday with one of our teachers from school. It was an interesting experience and I am glad that I have done it but i am not planning to return anytime soon. Firstly it lasted 5 hours and it was quite scary. There was a lot of shouting and shaking people to release the devil and some very strange traditions such as putting olive oil on your head and hugging a sacred box. I enjoyed the music and dancing but the other stuff was a bit intense for me. The 5 hour service made me very grateful for St Mary’s hour long chapel services! This weekend we went to Moshi, the next door town, to some more waterfalls which was good fun. We stayed in a hotel and we finally had a proper shower after 3 weeks which was amazing! We still have no water which is not fun but they have promised us that our water should come back on when the rain starts which it did at the beginning of last week although it hasn’t lasted. All 16 of us went for a nice meal on Friday night and we finally had some meat which made me very happy! 11 of us then left last night and the other 5 were left at the hotel as they are starting to climb Kili today which I hope goes well for them all!